Tropical Storm Danny has been upgraded to a hurricane. 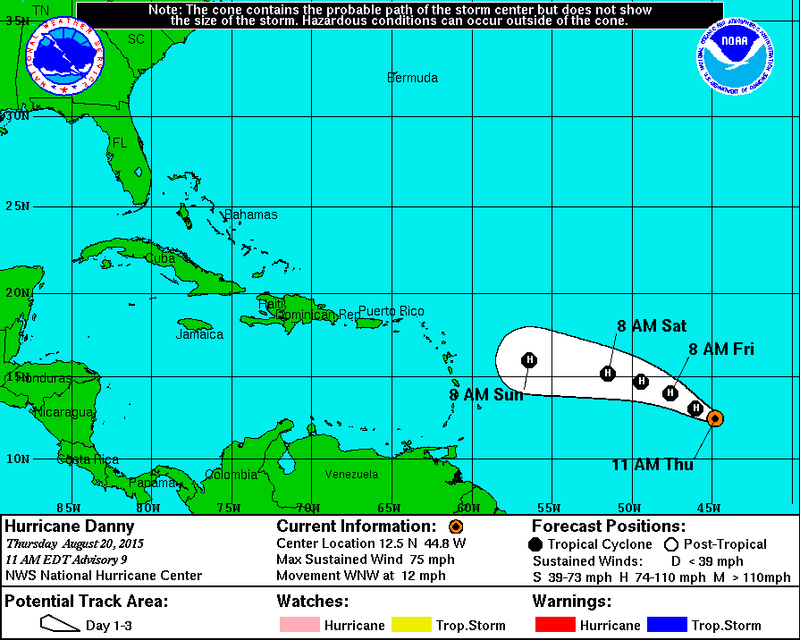 At 11:00 a.m., the centre of Hurricane Danny was located near latitude 12.5 degrees north, longitude 44.8 degrees west. Danny is moving toward the west near 12 miles per hour (mph). Movement is to the West North-West and is expected to continue for a couple of days. Maximum sustained winds remain near 75mph with higher gusts. Danny could experience additional strengthening in the next 48 hours. Hurricane force winds extend outward to 10 miles while tropical storm force winds extend outward up to 60 miles from the centre. The estimated minimum central pressure is 992 mb. Satellite imagery indicates that Danny has strengthened significantly during the past 6 hours. Maximum sustained winds are now estimated at 75 mph. Winds are forecast to be near 75 mph when Danny moves through the Leeward Islands early Monday. Conditions in the Caribbean are expected to be more hostile. Virgin Islands and Puerto Rico: Power outages are likely due to increased winds possibly by late Monday or early Tuesday. Flooding and mudslides are also possible. Residents of the British Virgin Islands are advised to monitor the system as it progresses and keep abreast of updates issued by the Department of Disaster Management. Visit the DDM website at www.bviddm.com and subscribe for updates, visit our Facebook page at www.facebook.com/bvi.ddm or follow us on Twitter at www.twitter.com/BVIDDM.